The Great Wolf Lodge Waterpark in Niagara Falls is the perfect family vacation. The waterpark features Fort Mackenzie, a four-story interactive treehouse water fort, and multiple thrilling slides for families and single riders alike. Other amazing features of the waterpark include the winding 500,000 litre Crystal River, seasonal outdoor waterpark of Loon Lagoon, two boulder themed whirlpools. 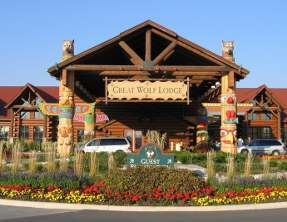 Great Wolfe Lodge Resort offers a themed experience from the waterpark to the guestrooms. The family oriented resort offers luxurious suites that the whole family will enjoy. Also available on this resort are multiple dining options to satisfy any taste buds. The Great Wolf Lodge Waterpark Niagara’s premier attraction for aquatic excitement! Great Wolf Lodge offers something for the entire family. For the children, Forest Friends Show and Story Time is best right before bed. Featured at Great Wolf Lodge Niagara Falls are Fort Mackenzie, the 1,000-gallon tipper, Northern Lights Arcade, Loon Lagoon, Crystal River, Whirlpool Hot Spas, Rainbow Lake, Niagara Rapids Run, Grizzly, Eagle and Bobcat Falls, Canadian Vortex, Wooly Mammoth and much more! Hours vary from season to season. Check the Lodge Life at check-in. Must be a registered hotel guest for waterpark access.